At TRIO Hair Studio we strive not to be the best salon in the world, or even in Michigan, because who’s to say that they are truly the “best”), but instead to be your FAVORITE salon…your FAVORITE experience…your FAVORITE home away from home. In 2016, we are incredibly excited to have our entire team all under one roof @ our Farmington Hills location . It truly gives us an opportunity to get back to our “roots” and focus more on what really matters to us…our relationships (with you, our team, our neighbors, & ourselves). We know that you will see the difference that 2016 brings to our brand. We’ve got a lot in store and are so thankful to you for joining us in this ride. We pride ourselves on offering the highest level of modern services within an approachable & fun environment. We look forward to seeing you soon and sharing the wonderful world of Trio Hair Studio. 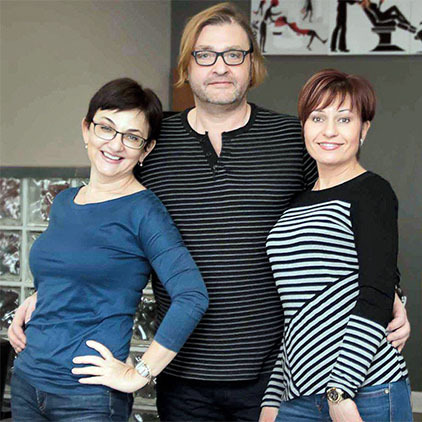 TRIO | hair studio. ©2016. All rights reserved.